With the increase in E-bike popularity, many new innovative designs and styles are being developed one in particular feature that is gaining popularity is the folding E-bike. This added feature makes storing the bike or moving it much easier. Some of the smaller folding E-bikes available can be carried on a train or bus and unfolded and used at the end destination. This feature can be very convenient for daily commuters. They can use public transportation part of the way and us their E-bike to get to their final destination. The fact that is easier to put in a trunk of a car or take indoors and store inside a closet dramatically reduces the chances of it being stolen. This a real concern for many expensive E-bike owners. I have compiled a list of 10 of the Best Folding Electric Bicycles. Most are under the $2000 range, and a few are under $1000. Most bikes on this list will be good for people that weigh up to 300 lbs. The fat tire bike, in particular, is better for larger people and people with an E-bike maybe the answer for you to get back on a bike. The added power will assist you in getting going, and if you peddle you will be adding some cardio and if you ride often you may I can almost guarantee you you will feel better. Before you purchase an E- bike be sure it is the proper size here is a Bike Fit Guide from Amazon. The E-bikes in the list below are good for people 5'2" to 6'4". The following list of folding E-bikes are smaller and more compact and are great to store in a small area. Although manufactures are trying to make E-bikes lighter the average E-bike weighs almost three times more than a normal bike. So that means they are not light. If you are having a hard time picking up your E-bike, remove the battery to make it easier to pick up your E-bike. The E-bikes on this list maybe smaller but they still weigh a lot and picking one of these bikes up and carrying it up stairs or putting it in a trunk maybe difficult for some people. Many bikes on this list are entry level E-bikes and if you want a lighter E-bike you will most likely be spending much more money. I will list a few higher end E-bikes to give you a better idea. This style folding E-bike is a very versatile. The fat tires give it a smooth ride on the streets and take a little air out and you can go on snow and sand. This bike style has a solid feel for a smaller E-bike and is ideal for a heaver person. The Bpmimports F-15X fat Tire E-bike is a solidly built E-bike that retails for $2200 but is often priced under $1500. Similar style as the Admotor yyyyy but with a better 48V*13AH Samsung Lithium Ion battery. The F-15X has a powerful Ba Fang 48V*750W 12AH Rear Hub Brushless Motor that will really get you going. Max speed is 25 Miles per hour. The Bpm import F-15x is a solid powerful E-bike. The powerful 750 watt motor will get a heaver person around with ease. Battery: 48V*13AH Samsung Lithium Ion battery. The Onway Fat Tire 20 inch electric bike is a great value E-bike. Priced at less than the BPM imports F-15x. The Onway can be an ideal E-bike for a smaller person. Priced under $1500 this E-bike packs a lot of value. Comes with bright colourful rims with Kenda 20" tires and with front fork suspension to absorb the bumps along the way. The Onway 20 inch comes with a less powerful 350 watt 36-volt battery with a top speed of 15 to 18 mph. Although rated for people up to 300 lbs the 350-watt motors range and speed will be adversely affected If you are above 250 pounds. If you weigh above 250 pounds, I would go for the BPM imports F-15x with the 750-watt motor and 48-volt battery. 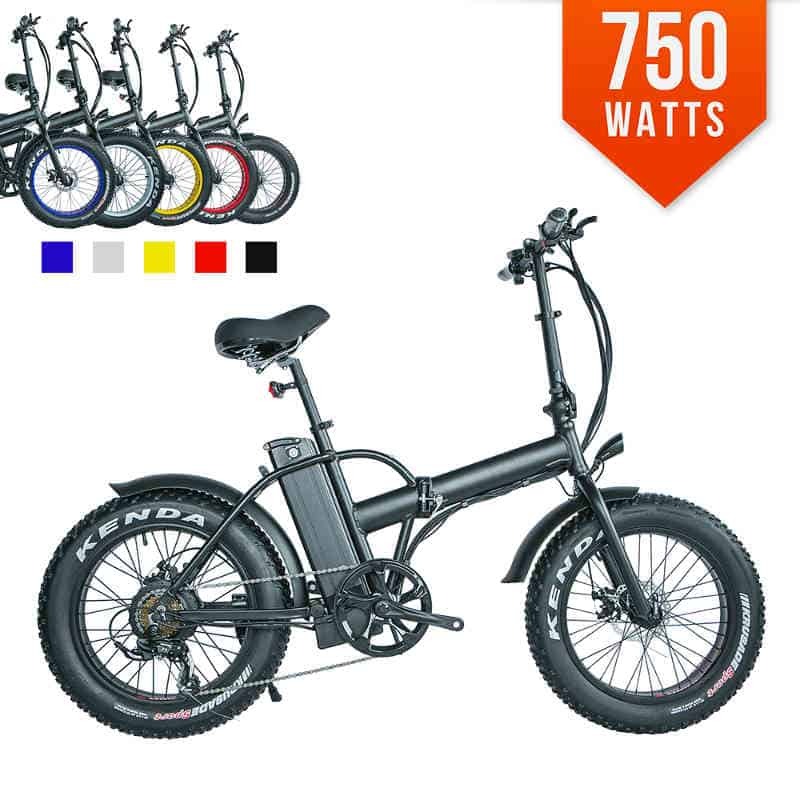 It is a few dollars more, but I think you will get an e-bike that will perform better for a heavy person. Having said that if you weigh under 200 lbs, this bike would be ideal for anyone to get around. 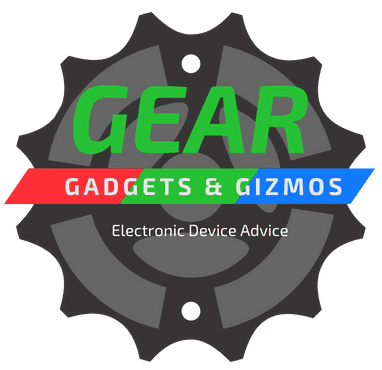 Many great features that are comparable to more expensive E-bikes. 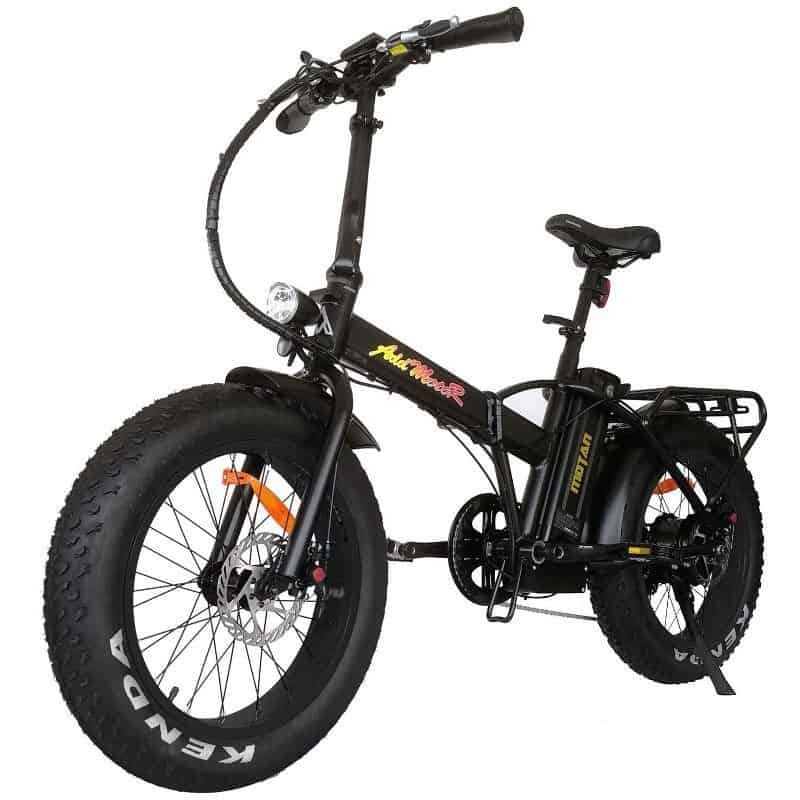 , The Onway Fat Tire 20 inch electric bike for the price is worth taking a look. Motor: 36v 350w BAFANG rear hub brushless motor - special design for snow beach all terrain. The Nanrobot N1 20" 350W Folding Electric Bike is an ideal city commuter. This E-bike is priced under $1000 and has a range of about 60 miles making it suitable as a city commuter. The smaller size and weight make this bike ideal for a woman or smaller person. The Nanrobot can be quickly folded to bring inside and tucked away easily. It has a top speed of 25 miles per hour and can nimbly ride through traffic. 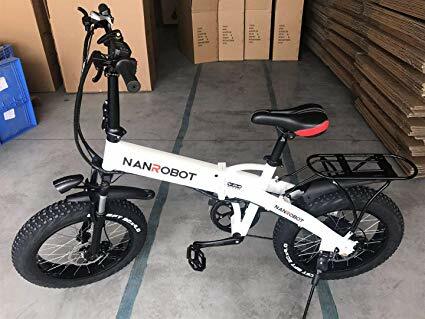 The Nanrobot has 2 Working Modes: E-bike & Assisted bicycle. You can choose the mode of E-bike and take it easy, or you can select the mode of Assisted mode and pedal more and get some exercise. The combination of the two modes will always get you further and faster on a charge. Here is a great little folding E-bike the Jetson not quite the flying car like George Jetson but a lot of fun none the less. The Jetson has a rear hub 250 watt motor to get you up to a Max speed of 16 mph. The smaller motor and compact size keeps this bikes weighs down to 38 lbs still heavy compared to a regular bike but less than a lot of other E-bikes on this list. The Jetson Metro has front and rear disc brakes and for a smoother ride it has rear suspension. 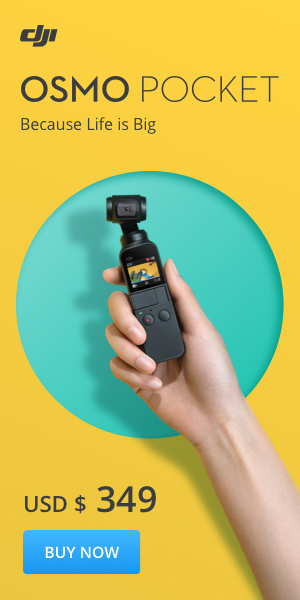 The Jetson Metro has a locking battery that is built into the frame and can be easily removed. This is an ideal E-bike for a daily commuters, it has a manageable weight making it practical to bring it on a bus or train and use it to get to your final destination. I It takes four hours to charge the battery and you get a 40 miles range. The MEIYATU E-Bike - Folding / E-Bike Scooter 250W is an excellent alternative to the Jetson Metro. Priced under $500 the MEIYATU E-Bike is very compact and easy to store. A solidly built bike but it It does weigh 44 lbs, so it is no lightweight. This E-bike can handle a larger person up to 330 lbs. The MEIYATU has cruise control, hold the throttle entirely down for over 3 seconds, it locks into full throttle, so you don't need to continue holding the throttle down. Packed with many extra features for the price range. The pedals fold for easier transport, and when you hit the brakes, it kills the throttle this saves energy and makes it safer to ride. It does have an 18-mile range, and if you run out of power, you can peddle home. 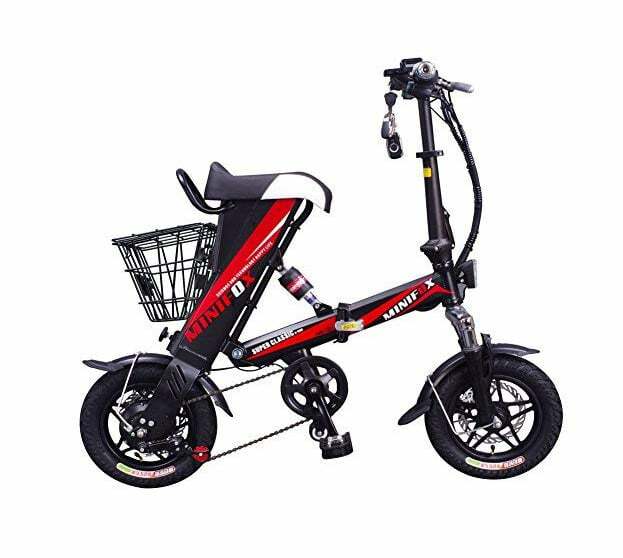 The MEIYATU E-Bike - Folding / E-Bike Scooter has pedal assist. Pedal assist works when the key is switched on, you start peddling, and after a couple of turns, the motor will begin lightly assisting and give you that extra boost that makes E-bikes fun. The drive unit on this bike is very smooth and quiet and includes three speeds. The MEIYATU has front and rear disc brakes for excellent stopping power. This E-bike is getting a lot of positive feedback from owners. For the price, this E-bike could be ideal for an older person to get around comfortable or for your everyday commuter that wants to ride a scooter but does not want to break the bank. Includes electronic horn and LED light. Tandem seat shown in the pictures is a separate purchase. Not included. If you want an E-bike that you can do a little more with then take a look at the Backcountry Stalker, it is a bit more pricey than a few of the other E-bikes on this list. 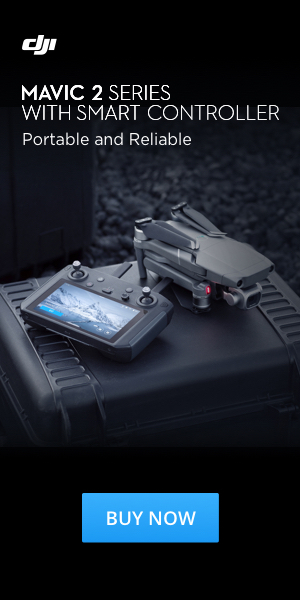 Priced at around $2500 but has more versatility and built with better quality components. The Stalker is a great street cruiser, but it also can be thrown in a trunk of a car and go out and make some backcountry trails on the weekends. The camouflage colour option and the silent motor make it great for hunters. The Backcountry Stalker comes in a few different colours Black and camouflage for the weekend hunter. The Stalker has a powerful rear 750-watt Bafang motor powered by a 48v lithium battery. The Kenda tires with 60 TPI will get you through any terrain. If you want a better quality E-bike and want to spend a little more then take a closer look at the Back Country E-bike Stalker this bike is built to last and take a few bumps along the way. Suspension: Front Mozo hydraulic suspension. Addmotor has been making E-bikes for a number of years. They have a broad line of E-bikes to choose from in many colourful styles. The Addmotor Motan Folding Electric Bike 48V 500W is no exception. This smaller sturdy E-bike is priced under $2000 and has many colour options. The Addmotor Motan 500W Folding E-bike comes with a 500-watt motor that can get you up to speeds of 25 miles per hour with a range of 45 to 55 miles using level one assist. The solid 6061 aluminium alloy frame can handle someone up to 300 lbs. The Addmotor Motan 500 watt E-bike could be a better choice than the Onway Fat Tire 20 inch 350 Watt E-bike for some heavier people. For a few hundred dollars more you get a beefier bike, a nice rack on the back with front and back fenders and you get a more powerful 500 Watt motor that gets a respectable range of 45 to 55 miles on a single charge. Priced around $1500 this bike has a lot of positive feedback from owners and is worth taking a look at. Some competitors have better components for the same price. The Green Bike USA GB750 Fat Tire Low Step Electric Folding Bike is very similar to the ONWAY Fat Tire 20 Inch Electric Bikes 350w and the Addmotor Motan Folding Electric Bike 48V 500W. For a few hundred dollars more you get but a more powerful 750 watt rear hub motor and a longer range. The Samsung large 48 Volt battery will go about 60 miles on a single charge. Made with quality components this bike is built in the US and has excellent customer service. The GB750 has many options to choose from comes in 5 different colours. Easy to read LCD screen. Nine levels of pedal assist to use depending on how hard you want to work. Wide, comfortable handlebars and comes with better fenders than the Addmotor and Onway. 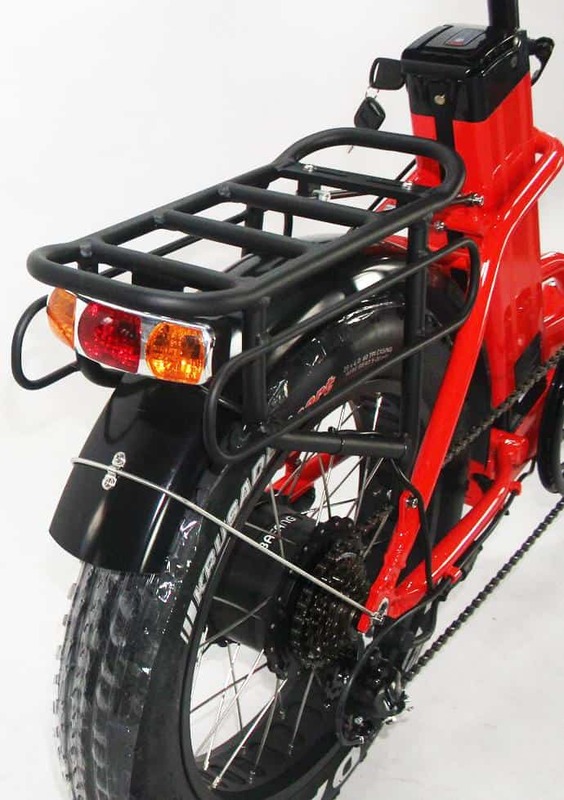 Also comes with a nice rear rack with a bright taillight for better visibility. List priced at $2500 it often goes on sale for around $1700. 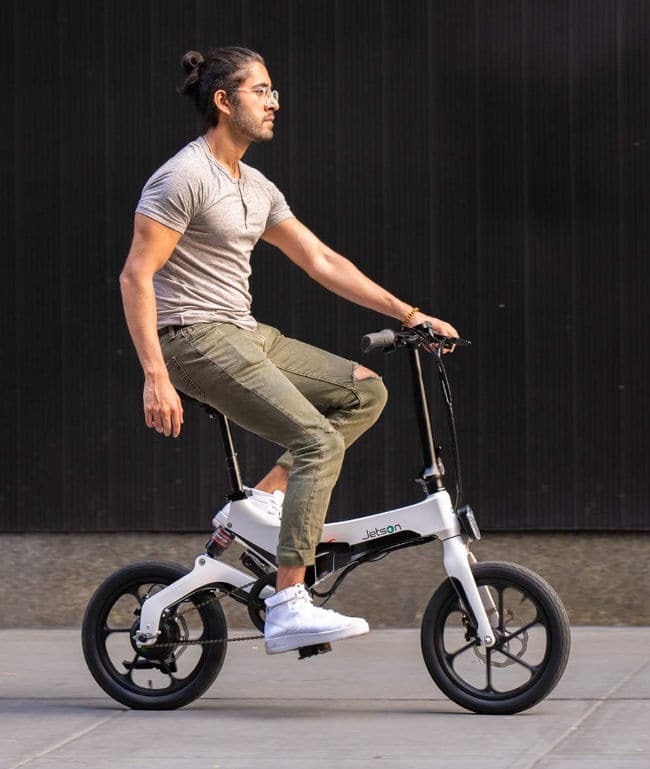 I put the Bagibike B10 Folding Electric Bike on the list because it is a little lighter alternative to some of the other E-bikes on this list and not so fast. It has smaller tires and weights in at 50 lbs relatively light in the E-bike world. The Bagibike is a more manageable E-bike to move around and store. This bike would be great for an older person to get around. Comes in many colour choices to stand out from the crowd. Comfortable, classy gel leather seat is offset with leather handles that operate the nine levels of pedal assist and throttle control. Top speed of 22 mph so it won't get away on you. Built with quality parts and including front suspension. They do offer the Bagibike in a fat tire model if you so desire. Priced at under $1600 keep an eye out for it to go on sale. An excellent versatile E-bike for the money. Not a super heavy bike and easier to put in a trunk of a car. I added the ENGWE E-Bike Folding Full Suspension Electric Mountain Bike for someone that would like a 26-inch tire. This E-bike is priced under $1000 and comes with front and back suspension. A good value at the new price. You get good exercise on a 26-inch bike, full leg extension when pedaling. More sporty than the other models on this list this E-bike could go out on the trails on the weekends and work as a daily commuter, during the week. Shocks work well for casual trail riding, but the front forks do chunk a bit, not from bottoming out but at full extension when dropping into small holes.